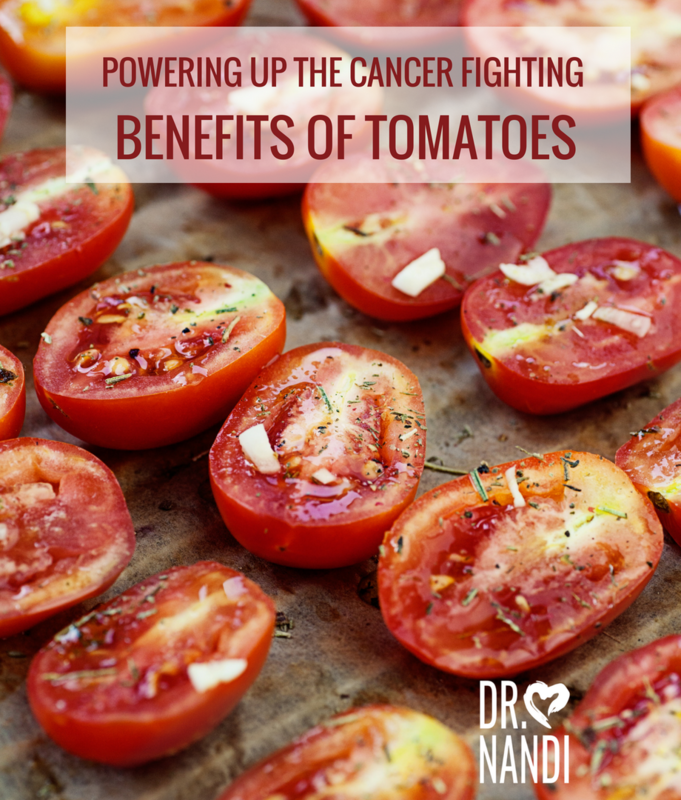 Tomatoes and Olive Oil have been a longtime classic combination on the dinner table, but did you know that having the two together kicks up the health benefits of the tomato? Dr. Nandi’s Power Pairings are foods that, when combined, unlock additional health benefits so you can get the most health benefits out of your Italian night feast! Tomatoes contain Lycopene which is a carotenoid antioxidant that gives fruits and vegetables a pink or red color. It is one of the biggest reasons why you should eat tomatoes. Researchers have found that combining tomatoes and olive oil increases the antioxidant activity because lycopene is a fat-soluble nutrient. Fat soluble nutrients need some fat to be absorbed properly. Researchers have found that cooking tomatoes are an even healthier approach than eating them raw. When a tomato is cooked, the lycopene content that gets absorbed by the body is increased, so why not have some tomato sauce drizzled with olive oil today? 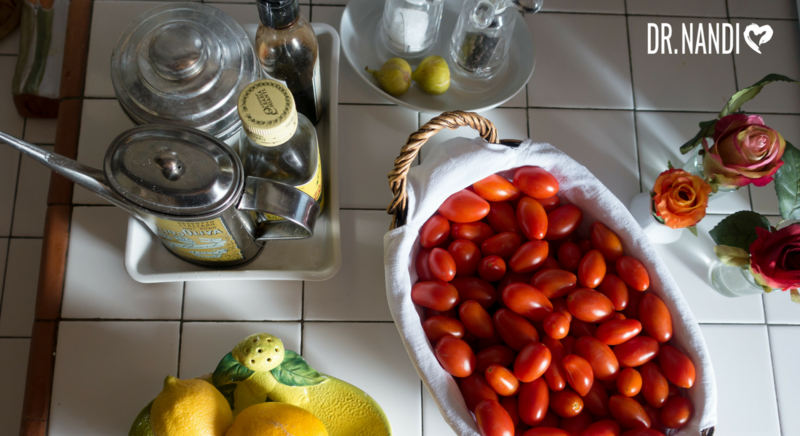 Did you know cooked tomatoes are better for you than raw? Did you know that consuming cooked tomatoes whether in spaghetti sauce or fried up in olive oil makes them heart healthier and boosts its cancer fight ability? Even though cooking tomatoes causes them to lose vitamin C, the benefits are increased by the spike in levels of the compounds called phytochemicals. Tomatoes are famous for being a great source of the antioxidant lycopene. Cooking the tomatoes brings out more lycopene making a cooked tomato a significant source of the antioxidant. Tomatoes also contain other antioxidants, such as beta-carotene, that help fight cell damage that can cause cancer, heart disease and other chronic health conditions. Will cooking with olive oil make you fat? Olive oil has long been touted as one of the best ways to get heart-healthy fats in your diet and now biochemists have been studying why olive oil may help with weight loss and prevention of type-2 diabetes. Olive oil contains a compound called oleuropein. It is believed that oleuropein helps the body produce more insulin, which helps regulate metabolism and allows cells to use sugar for energy, making you less likely to gain weight. Can cooking with olive oil cause cancer? If an oil is heated beyond its smoke point, it gives off toxic smoke. The smoke point of olive oil is around 400 F. This makes it a medium range oil for cooking but recent studies have found that the good benefits of olive oil greatly outweighs the bad. There is a high concentration of monounsaturated oleic acid that helps to keep the heart healthy and may even protect against certain cancers. When heated beyond its smoke point, however, olive oil oxidizes into cancer-causing oxygen radicals like ketones, peroxides, aldehydes, and hydroperoxides. As long as you keep it from the smoke point, it is great to cook with and consume. Extra-virgin olive oil is made from pure, cold-pressed olives, whereas regular olive oil is a blend, including both cold-pressed and processed oils. Does it matter which I cook with? Yes and No! Plain olive oil is cheaper and perfect for general cooking and sauteing. If you need to just add oil to the skillet, this is the perfect oil. Dips, dressings and other uncooked items, extra virgin olive oil is the way to go. Both contain all the health benefits as well. What does the grade of olive oil mean? Extra Virgin Olive Oil – This oil has zero defects and greater than zero positive attributes. Virgin Olive Oil – These are oils with analytical and sensory indices that reflect slightly lower quality than extra virgin olive oil. Is there a difference in nutritional benefit of using fresh versus canned tomatoes? Studies suggest that canned tomatoes are healthier than fresh tomatoes. To can a tomato, heat is used which releases lycopene. Lycopene is a carotenoid that may help prevent prostate and breast cancer. Canned tomatoes are now available in glass jars or aseptic boxes in addition to “BPA-free” cans. What is wrong with BPA? Studies have linked BPA to infertility, heart disease and diabetes. The FDA is encouraging packagers to find alternatives to BPA, and studies on its effects are ongoing. Should you cook with the skins on or off the tomato? Does it matter? Cooking with the skins of tomatoes is a matter of taste and texture but tomatoes have amazing antioxidant properties in their skin. Plus the peels of tomatoes contain the most fiber, which is key for moving food through your digestive system, healthy elimination and protection from colon cancer. What’s the story with frozen tomatoes? Freezing tomatoes is a great way to lock in their flavor and their health benefits for the winter months. Most people use frozen tomatoes in sauces or stews which help to release the potassium and lycopene. Tomatoes are great frozen for roughly 6-7 months. Can I cook tomatoes in aluminum? Studies show that aluminum foil can leach aluminum into your food. Some studies have suggested that roasting acidic foods like tomatoes in aluminum foil may leach more aluminum into your system but not to a dangerous level. Does it matter if I store tomato based foods in plastic or glass? The best way to store tomato based foods is glass. Plastics have been known to contain BPA which stands for bisphenol A. BPA is an industrial chemical that has been used to make certain plastics and resins since the 1960’s. Studies have linked BPA to infertility, heart disease and diabetes. The FDA is encouraging packagers to find alternatives to BPA, and studies on its effects are ongoing. In a medium bowl, mix basil, thyme, salt and pepper together. Add 9 Tbsp olive oil and stir. It will become paste-like. Spread paste on cut sides of tomato halves. In a skillet over medium-low heat, add remaining olive oil. Place tomatoes herb side down and cover. Simmer for 4-5 minutes. Tomatoes should be heated all the way through but not stewed. In a food processor, add tomatoes and sauce. Pulse until you get a smooth texture. In a large saucepan over medium heat, add onion, carrots, bell pepper, mushrooms celery and garlic. Cook until onions soften and garlic becomes fragrant. About 3-5 minutes. Add tomatoes and bring to a boil. Simmer for 35-40 minutes. Vegetables should be soft. Using a food processor, puree sauce.